Are you only looking for angulation at the hock? Now this will teach me, my spelling isn’t always crash hot, so I went Google for parts of the dog, no wonder folks are confused about anatomy & conformation – crest has always meant the convex top surface of the neckline, this one site has it for the occiput! 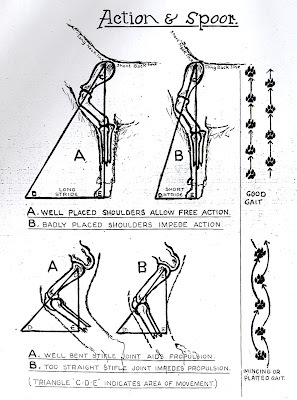 The illustration here is from William Denton’s Canine Culture The Dog Owner’s Manual (illustrations by the author) published circa 1950 and shows so well how the angulation of the fore and hind quarters can be ‘judged’ and in particular the effect of a soft/gentle angulation has on the length of stride compared to a well angulated dog.